Home / ADAPTATION / CELEBRITY NEWS / FILM POSTERS / MOVIE TRAILERS AND INFO / Ryan Gosling plays Neil Armstrong in New Biopic Movie "First Man"
Ryan Gosling plays Neil Armstrong in New Biopic Movie "First Man"
After singing and dancing and looked awkwardly amazing opposite Emma Stone in "La La Land", Ryan Gosling is back in a biopic movie about the life of one of history's important personalities, NASA astronaut Neil Armstrong in the upcoming movie, "First Man". "First Man" movie focuses on Neil Armstrong's life with his wife Janet, played by Claire Foy, and NASA's mission to send astronauts on the surface of the moon. The movie is based on a book written by James R. Hansen. Set during the 1960's, the movie explores the personal life of Neil Armstrong and the how NASA's most dangerous mission has changed the world forever. If you have watched the film "Hidden Figures", there was a scene there where the three lady characters meet Neil Armstrong saying they were the ones calculating NASA space mission's trajectory. Such a lovely crossover if this scene will be included in "First Man". See our "Hidden Figures" movie review here. Anyway, for all Ryan Gosling fans out there, here's another movie offering from your idol that you should not missed. "First Man" will be coming out in movie theaters soon! 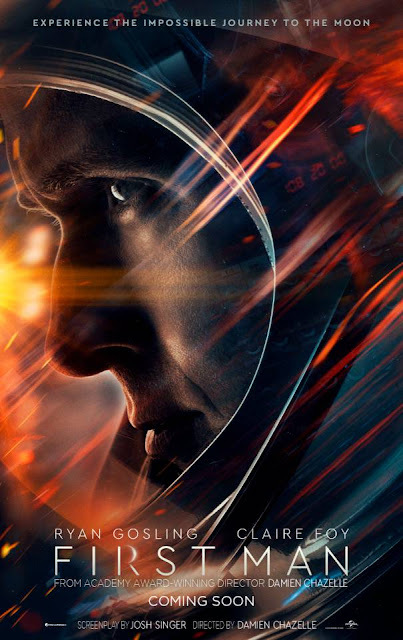 For now, here's the official movie trailer for "First Man" starring Ryan Gosling and Claire Foy from Universal Pictures and Dreamworks. Enjoy!